Recently one of my best friends turned 30 and she wanted to celebrate in style. Of course, I jumped right on board! Kate loves champagne and it seemed like the perfect party theme. 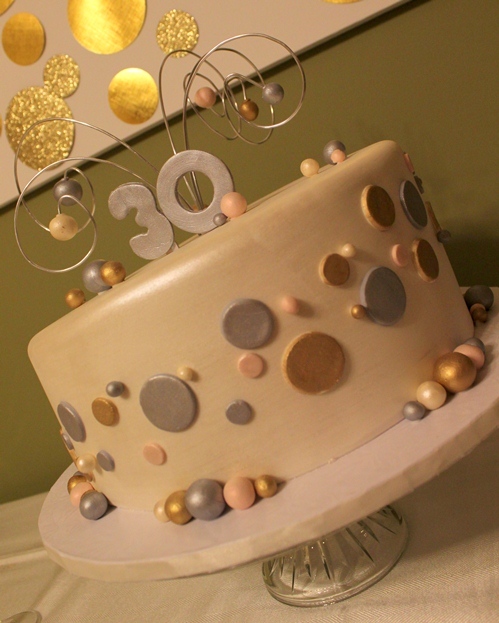 We took a range of metallics, added some glitter and the party was on! Kate and her husband we lovely enough to help Mr. Lemon and I construct a glitter bubble chandelier over their kitchen island. The four of us spent an afternoon stringing fishing line and glitter filled ornaments in the middle of their home. The effect was stunning and last I knew, they still hadn’t removed it! Because the party continued onto the second floor’s bonus room, we wanted a connection between the two spaces. 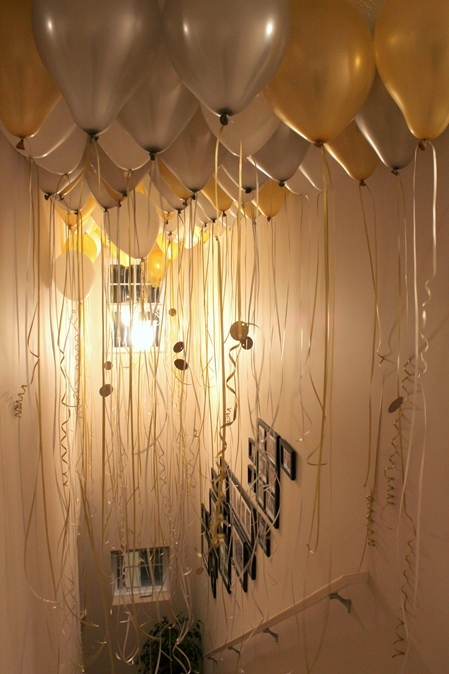 We filled the stairwell with about 75 white, gold and silver helium balloons tied with ribbon streamers that came down to the floor. I really loved how it turned out and walking through the stairwell was a bit magical! It would also be an amazing way to style an entryway to greet your guests. 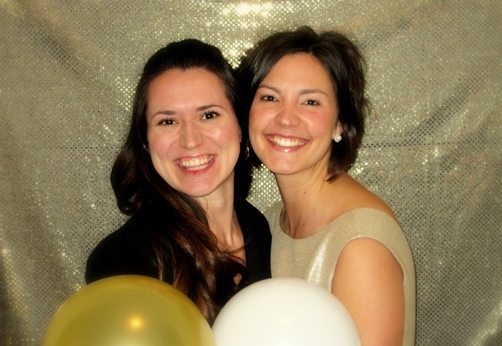 For the photobooth, a sequined gold fabric worked as a simple but very effective backdrop. In the store, the fabric looked a bit gaudy, but when we took a few photos of it, we realized that it photographed just perfectly – this is an important thing to remember for photo backdrops! Make sure to take a few trial photos beforehand to make sure your backdrop isn’t too shiny or hanging to high or low, etc so that you can fix it before the party! 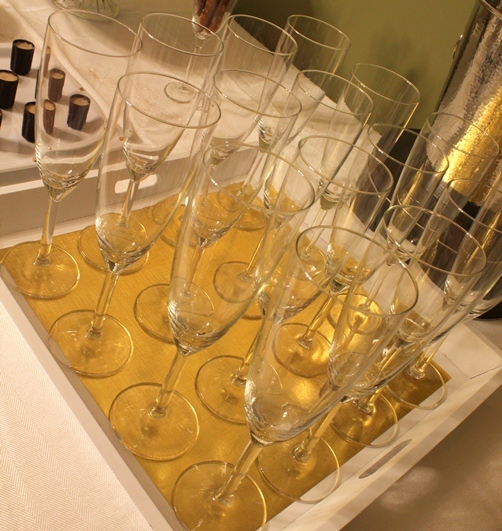 The dessert and drinks table included the champagne and wine as well as chocolate truffles, chocolate covered pretzels with edible gold stars, chocolate shot cups with Bailey’s, and an amazing cake for the centerpiece! MiraBella Confections (the same people who made my birthday cake!) made the most beautiful and delicious cake! They took our inspiration photo and made it even better with an amazing caramel coconut filling that was to. die. for. 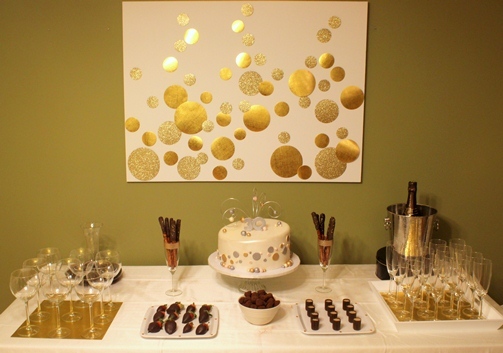 For the backdrop of the dessert table, I created a champagne bubble inspired canvas art with glittery and shiny gold scrapbook paper – I simply cut out circles and taped them onto the canvas! I think this could be such a beautiful permanent piece of artwork if you glued the paper down and it was inspired by this piece from Mint Love Social Club. 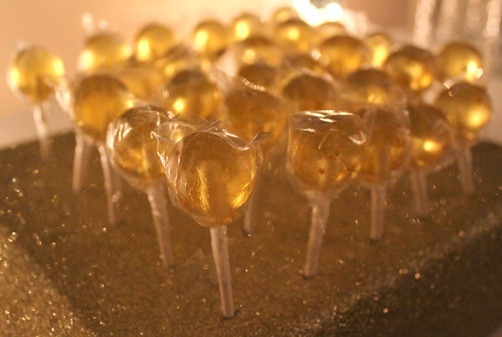 Champagne flavored lollipops from Vintage Confections were the perfect party favor! I think this theme would be lovely for New Year’s Eve, any milestone birthday as well as a bridal shower or bachelorette party. I had such a wonderful time planning with Kate and can’t wait for her next birthday! This entry was posted in Event Portfolio, Party Inspiration and tagged bachelorette party, bridal shower, dessert bar, drinks, glitter, gold, grown up party, milestone birthday, new year's eve, silver. Bookmark the permalink. This party is fabulous!! 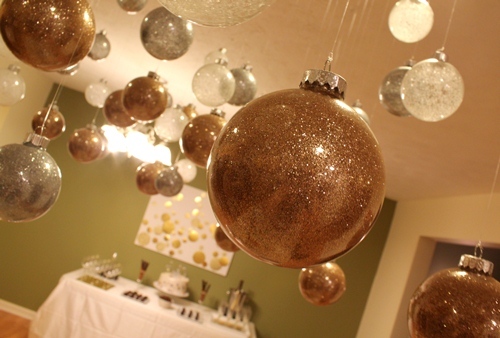 The glitter balls and balloons are simply stunning! Wonderful job!! LOVE!!! That cake is so gorgeous, I’m dying. I especially love when you post the parties that you were involved in. I wish you could help us plan our “70th” birthday party for May. Too bad you’re so far away! What’s the 70th birthday party? I can always help via Pinterest ;)! Magnus turns 40 on May 13 and I turn 30 on May 18, so we’re going to be 70 :o) We have to start planning soon and figure out what we’re doing. Turning 70 is a big deal! Oh how fun, I love it!!! Beautiful! Thanks for helping make my sister’s birthday a wonderful celebration! Wish I could have been there to taste that cake and enjoy the party! Love it all! But especially the glitter balls and that piece of art behind the table! So so elegant + fantastic! This party looks awesome!!!! 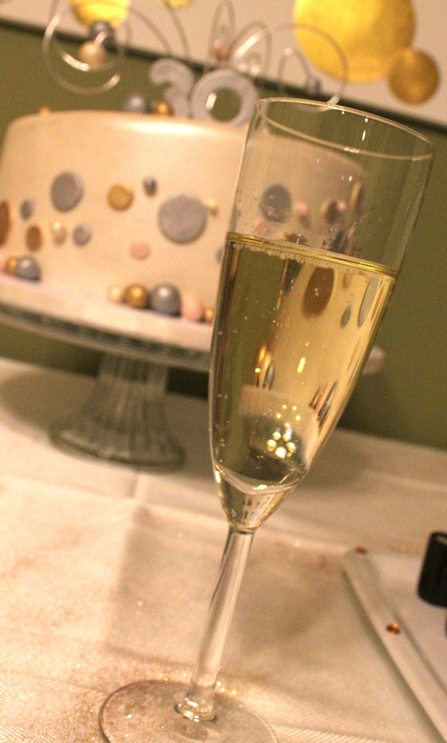 LOVE the way you re-interpreted the confetti art into champagne bubbles! Oh thank you! I just loved your piece and it adapted so wonderfully for this party! Beautiful!! Love the colors you chose for this party and all the decor! We are trying to recreate the glass ornaments (glass stars though). May I ask which glue and glitter did you use (method we are using is not spectacular…uneven glue coverage inside ornament and glitter may be too fine). Also, how did u attach to ceiling? I used floor wax inside the ornaments, just like this tutorial…http://thegreenbeanscrafterole.blogspot.com/2010/12/all-that-glittersminus-mess.html In my experience, the finer the glitter, the better it stuck to the glass. 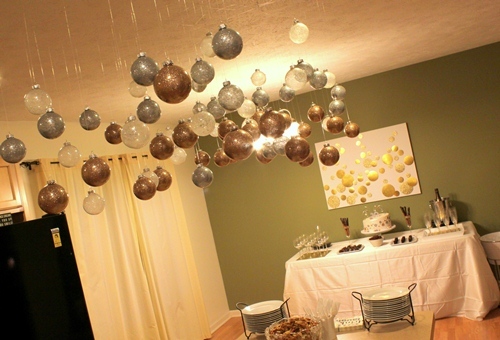 We used a handful of those screw-in hooks and fishing line to create a grid on the ceiling – all of the ornaments were strung from the fishing line grid. Such a beautiful theme, decorations are gorgeous. Did you make invitations to match the theme? Would love to see them as well. My 30th b-day is in four weeks at a restaurant and I’ve been trying to come up with a theme that would make my night feel like an event and this is it!!!! I love the colors and everything!! !